Interested in becoming a new client? 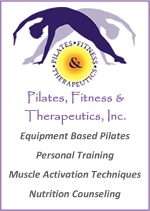 Here are a few forms that need to be filled out so we can give you a pilates experience tailored just for you! For your safety, we request that you wear Pilates/yoga socks with sticky bottoms while in the studio. If you have a pair, please bring them along or a pair may be purchased at the studio. The following list gives you an overview of our services and prices. Prices are subject to change without notice. Check and cash are accepted forms of payment. Check or cash are due at the time of service. If you’d like a custom quote, call (239) 398-5050 or click HERE for more information.